Are This Donkey and Emu Really in Love, Or Is It Just Cuffing Season? Filed to: what is love?Filed to: what is love? A donkey and emu, an unlikely pair, are reportedly in love. Both rescued at the Carolina Waterfowl Rescue outside of Charlotte, N.C., The Charlotte Observer reports that these two have grown to comfort each other, even cuddling and sleeping together in the same enclosure. “They are very bonded,” the rescue wrote on Facebook. At one point the male donkey was living with three others at the rescue and attacked them. 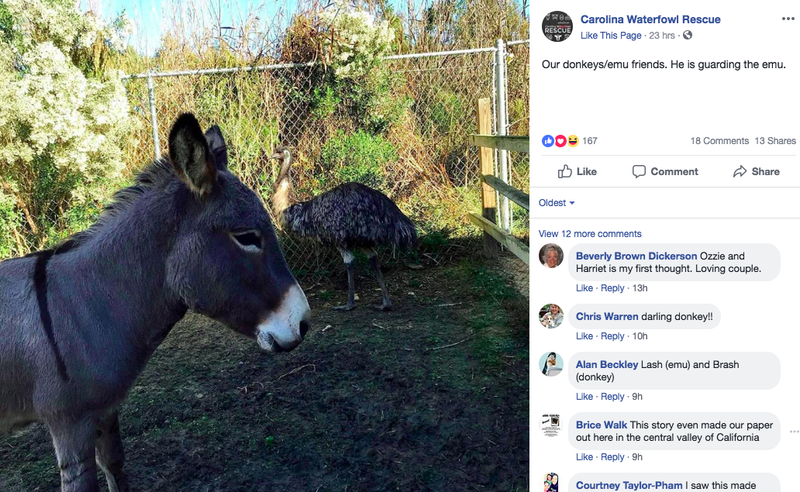 The donkey then reportedly started to cry and the emu grew upset, pacing around “like an expectant father,” the Observer reported. But while I’m thrilled these two have found romance, I’d like to kindly point out that it is indeed the beginning of cuffing season. As Judnick Mayard wrote for Jezebel in 2015, cuffing season is “the moment when you say goodbye to all your sleek summer boos and start looking for a cuddle bear, somebody to fill your inbox with cashmere nudes and iMessage ellipses when you’re horny.” Basically, it’s when it gets crazy cold out and you’re just looking for someone to regularly bone and snuggle up to, since dating and hooking up in the freezing winter is haaaard. You take what you can get. And so I sense that perhaps what’s going on between this emu and donkey, while they look lovely together, is not exactly love but perhaps a shared sense of horniness and boredom as temperatures drop. At one point the Observer asks Jennifer Gordon of the Carolina Waterfowl Rescue how this even happened. Her answer: loneliness! I’m just calling it like it is.